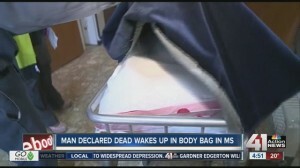 Man Declared Dead Later Wakes Up In Body Bag At Funeral Home. Even in the Bible Belt of Mississippi, corners don’t use the word “miracle” lightly. 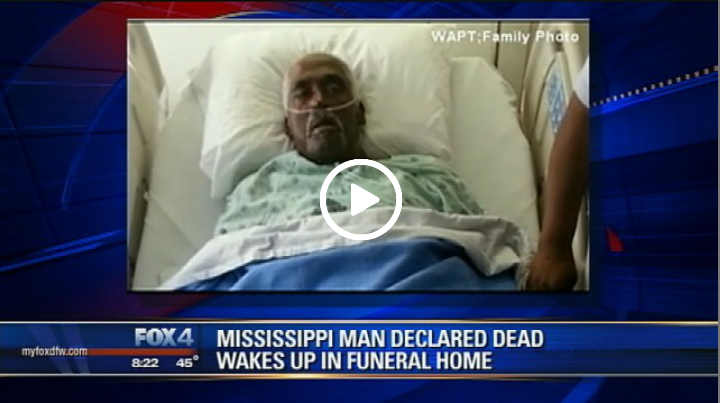 But in Holmes County, Mississippi, corner Dexter Howard has no qualms using the word for the resurrection of Walter Williams, who was declared dead Wednesday night. Howard receive a call from Williams hospice nurse, who told Howard that the 78-year-old had passed away. A family member called as well saying the same. Howard and Byron Porter from Porter and Sons Funeral Home in Lexington, Mississippi, drove to Williams’ home to collect the body for funeral preparations. Howard checked Williams pulse about 9 p.m. and pronounced him dead. The corner completed his paperwork, place Williams in a body bag and transported him to the funeral home. There, something strange happened – the body bag moved. “We got him into the embalming room and we noticed his legs beginning to move, kicking a little. He also began to do a little breathing,” Howard said. They immediately called the ambulance. Paramedics arrived and hooked him up to monitors. Sure enough he had a heart beat so they transported him to the hospital. Howard visited Williams on Thursday at the hospital and said he was still a little weak but was surrounded by family members and talking.